Real Table Tennis is the best Ping Pong game you must play on your Android phone. The gameplay has simple controls and it is challenging a little on more difficult opponents. The graphics are immerse, it is stunning and also the radar which is for how much power your shots have and timing really helps. Feels like playing Real Table Tennis! How to play? 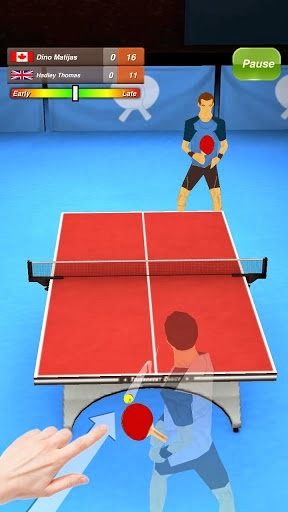 It is easy, just swipe your finger in a direction you want the Table Tennis Ball to go. Timing your swipe is critical for a fast shot that is hard to return. Starting your swipe too early or late will send a slow shot to your opponent which is easy to return. So start your swipe when the ball is in a perfect position for a fast and precise shot.